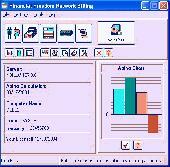 FREEWARE program for cybercafe or internet cafe automation and technical administration. Billing, limiting internet speed, increased security, enhanced usability, customizable interface. As a Cyber cafe owner maintaining customer time in & time out log, manual calculation of the bill amount & bill generation must be some of the problems faced by you. Now, its time to say bye-bye to all of them. Webcafe will manage everything for you! Billing of services for cable TV companies. Main features: Detailed information about customers; Customer's accounts; Planning cable nets; Inventory. And many other features. . .
FAST Client/Server Network Technology for your invoices and billing! Runs on all Windows Networks for Windows systems with the TCP/IP networking protocol installed. Features: unlimited invoices, quotes, payments, customers and products!